I recently bought this stamp set used (love the cost savings!!) and I was eager to try it out. 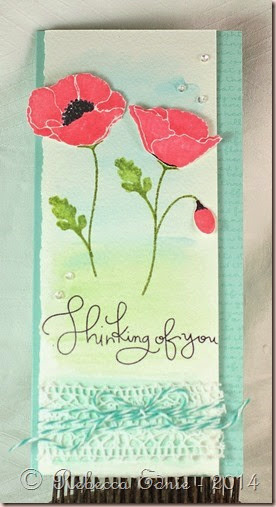 I needed a couple thinking of you cards anyway and I LOVE this Thinking of You sentiment from Simon Says Stamp. I used Twinkling H2Os for the background. It is subtle but pretty and shimmery. I used green at the base of the poppies, blue at the top and turquoise at the bottom. I originally die cut the flowers with the matching dies but I wasn’t a fan of the white edge so I trimmed them by hand. Especially when layered over the stems which were not die cut. I stamped the flowers in Distress ink but the results were splotchy on the watercolour paper so I smoothed them with a wet paint brush. Then I added some more colour from the ink pad smooshed on my craft sheet to add some depth. I’m afraid that doesn’t show very well in the photo. I added some black accents with a C9 and 100 (black) Copic marker. To finish the card, I added some crocheted lace and twine. The watercolour panel was layered on an aqua card base stamped with the script stamp from the poppy set. I’m really sorry to have posted so infrequently lately. Summer was really busy and I’ve been suffering with a really bad case of frozen shoulder. I have a lot of pain and very limited range of motion. So a huge thank you to all of you who have stuck with me and not unsubscribed!